Dirk Kuyt is an attacker who plays for the Netherlands and Liverpool in the English Premier League. Kuyt has played as a conventional striker, whilst Fernando Torres was injured, but is more commonly played on the right wing or in ‘the hole’ behind the main strikers, where he can best use his superb passing ability. He has a habit of scoring important goals, getting a few in injury time, helping Liverpool to be genuine contenders for the league title. He has been a key performer for the Oranje since 2004, linking up most recently with Sneijder and van der Vaart in their successful 4-2-3-1 formation. 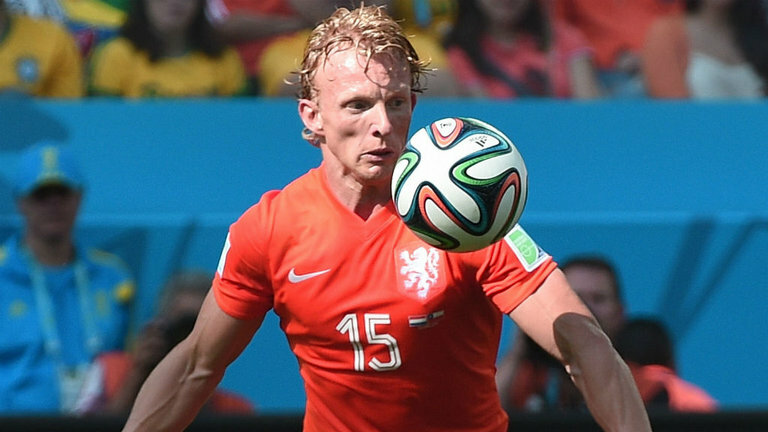 Dirk Kuyt was born on 22nd June 1980 in the Dutch coastal town of Katwijk, where his father was a fisherman. Kuyt supposedly had to choose between fishing and football as his main career, and unsurprisingly chose to play football! As a child, he was often found at the local park with his older brothers playing football until it was dark. His first football appearance was for his local team, Quick Boys, but it soon became apparent that he was meant for bigger and better teams. FC Utrecht had Dirk Kuyt on their books from the age of 18, having watched him all through his youth football career. He was considered to be a little too skinny to lead the line as a striker, so was given a right-wing position where he wouldn’t get too bruised by over-enthusiastic tackles from centre-backs. As he matured and developed, Kuyt began to get more games in the centre of the park, behind the main striker, and he made this position his own in 02/03, when he managed to net 20 goals for the club. Because of his impressive form at Utrecht, it was almost inevitable that Dirk would end up at one of Holland’s big three. Ajax and PSV were both interested, but it was Feyenoord who met Utrecht’s £1.2m asking price first, and snapped Kuyt up. Kuyt proved to be a revelation for the Feyenoord fans, adapting to being expected to score goals by scoring more than ever! 71 league goals in three seasons wasn’t a bad return for a deep-lying striker, and it was these goals that made him a favourite with the manager, and team captain. Dirk Kuyt’s stunning form a Feyenoord had big clubs thinking whether he would be able to take the next step, and play for one of Europe’s big boys. Dirk Kuyt joined Liverpool in August 2006, signed by Rafa Benitez for around £8m. He wasn’t the big-name that fans were hoping for, but he soon proved to the Kop that he had the technical ability to do well at Anfield. He won some plaudits by tracking back whenever he lost the ball, but it was the fact that he was willing to sign autographs all day that led the fans to love him. In his first season at the club Liverpool made it to the final of the Champions League, with Kuyt scoring their only goal in a 2-1 defeat to AC Milan. Despite the success of the first season in England, Kuyt started to suffer from a loss of confidence in his shooting, meaning he netted just 3 times in his second season, a tally he had already beaten by Christmas time in his third season. Kuyt links up well with Steven Gerrard and Fernando Torres, and is one of the key men in Liverpool’s title-push. Dirk Kuyt made his international debut in September 2004, as one of the players brought in to freshen up the team after a poor showing at Euro 2004. He played his part in the qualifiers for World Cup 2006, but lost his place in the first-team when Marco van Basten made peace with Ruud van Nistelrooy on the eve of the Finals. At Euro 2008 he was back in the first-team, linking up with van der Vaart and Sneijder as the attacking line behind the main striker. He is fast becoming a key member of the team, and one of the most experienced.